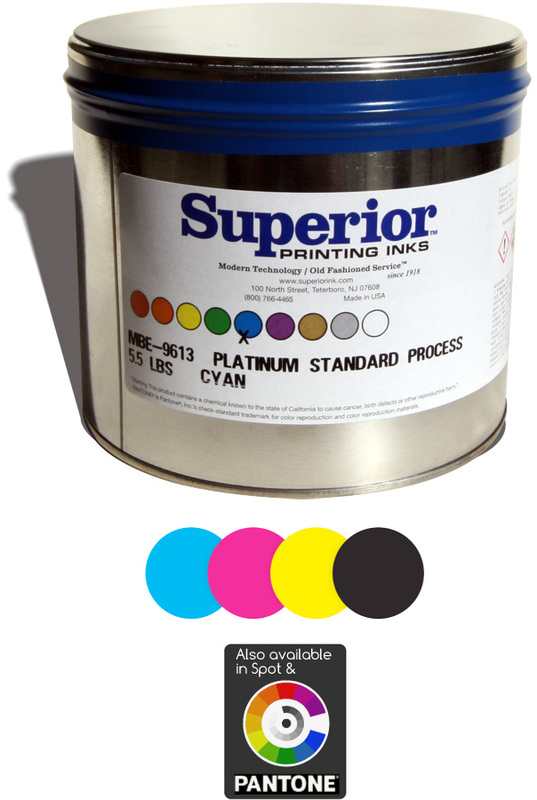 Superior’s O/S Platinum Standard process ink is the best choice for the sheetfed printer who is serious about meeting the challenges of top quality and on time delivery in today’s highly competitive market. O/S Platinum Standard inks are manufactured using 25% bio-renewable raw materials and are formulated to provide outstanding performance on today’s high speed perfecting presses with stable ink / water balance, good rub resistance, excellent dot reproduction and high gloss. Fast setting speeds allow the printer to run with little spray powder while meeting the demanding production schedules in today’s fast-paced manufacturing environments. The Platinum Standard series’ stay open properties mean less digging inks out of the fountains and more time printing. Using fine pigment dispersions, the Platinum Standard series inks allow for consistent color stability during extended press runs. O/S Platinum Standard process inks have been formulated to conform to the ISO 2846-1 standard allowing the printer to achieve a variety of today’s print conditions (ISO 12647-2, G7, GRACoL, etc.) in the pressroom.